For ye Stinge of an Adder or bite of a mad dog 220 12 Take half a handfull of rue & young walnuts leaves mixt, or when no tender walnuts leaves cant be had, take as much of ye middle rine & 2 lent figgs pound al these, and put them into stronge drink, with a little honey then straine away all ye Ingredients and so drink it half as much of each will be enough for a child. Lett all stand and infuse awhile before you strain it. 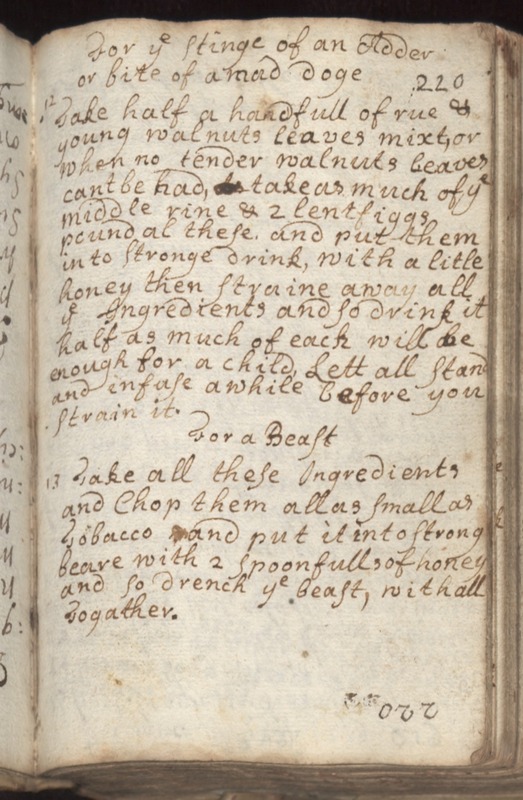 For a Beast 13 Take all these Ingredients and Chop them all as small as Tobacco and put it into strong beare with 2 spoonfulls of honey and so drench ye beast, with all Togather.